We know that when you’re planning an event, whether it’s a small birthday party, business conference or wedding reception, the details matter! Below you’ll find a list of some of the key questions we get asked by our visitors. We hope that you find all that you need, but if you have any further questions about hiring High Bickington Community Centre, please don’t hesitate to get in touch – we’re more than happy to help. The Main Hall can hold 200 guests (theatre style) or 120 guests (banqueting style). Crockery, cutlery and glassware for 100 covers is provided. The Pyncombe Room seats 60 theatre style or can be set out with tables for seminars or small groups. 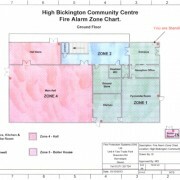 A floor plan of the venue can be viewed below. We offer a number of either 6ft round or 6ft trestle tables and up to 200 chairs. The Pyncombe Room is circa 60 square metres. We also have large reception areas that are big enough to place a mobile bar and extra seating. Is the Venue suitable for Marquees? 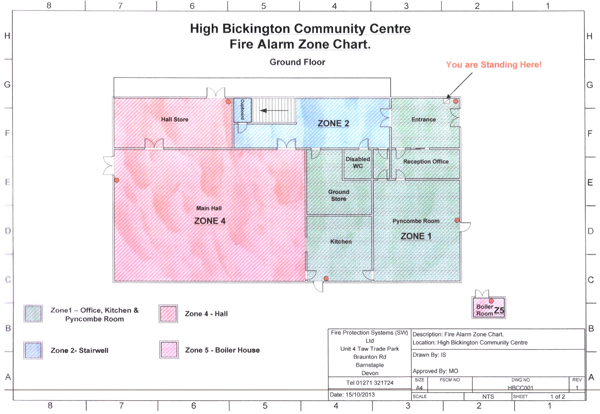 Yes, High Bickington Community Centre has large grounds in which to host a marquee. We have a strong relationship with local North Devon marquee companies who provide high quality marquees and a full professional service. Our beautiful grounds are a popular site for marquee based events in North Devon. Do you have a caterer onsite / on-hand, or is all catering to be outsourced? The Community Centre has a large fully equipped kitchen with commercial dishwasher, double sinks, 2 x 60cm hobs & ovens, microwave, instant heat water boiler for tea, coffee, etc. We anticipate that most banqueting functions will be catered by external caterers (we are able to provide you with local recommendations if required), although it might be possible that we can cater for small events – please make an enquiry. Sunday to Thursday 10:00am – Midnight. Friday & Saturday 10:00am – 1:00am. New Year’s Eve 10:00am – 2.00am. We also allow guests to provide their own outside bar with permission. Large public functions are required to provide their own licensed door staff. Yes – we have modular staging too! 32 sections each measuring 75cm x 75cm (18 square metres in total) at 50cm high. Access steps also available. Friday & Saturday 10:00am – 1:00am. New Year’s Eve 10:00am – 2.00am. We have facilities for Power-Point presentations and can project TV programs onto a big screen. All rooms all have hearing loop systems fitted for those hard of hearing. At present there is no microphone facility available. What sports equipment is available for use in the sports hall? We have equipment available to hire for badminton, table tennis, netball, short tennis and football. Do you have free wifi for conferences and meetings? We have wifi available, please ask in the office for the code.